Desiree Ramirez, a credential coordinator in the healthcare industry, decided to do something completely different with her life, getting a college degree at New Mexico State University’s Creative Media Institute. Ramirez graduated as a filmmaker in May 2018 with a music video on her resume for a No. 1 gospel hip-hop artist. She launched her career producing her first music video, “I got Angels,” for Emcee N.I.C.E with help of professors and classmates. Ramirez is one of hundreds of students who get real-world experience while earning their college degree through NMSU’s CMI in the College of Arts and Sciences. Film and television production in New Mexico hit an all-time high in 2017 with the number of productions over the $1 million mark at 61, contributing more than a half billion dollars to the state’s economy. 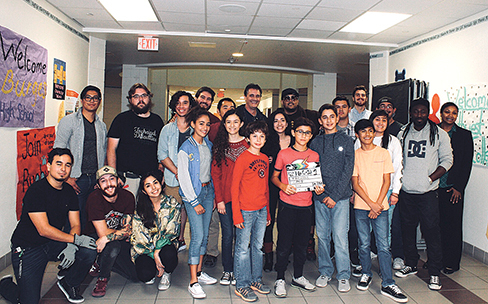 NMSU’s CMI is also creating jobs by generating feature-length film projects locally, such as “Walking with Herb.” Marks, the director of the project that filmed in the Las Cruces area in September 2018, employed 41 CMI students. Marks says this homegrown project is a first. Tony Award-winning playwright Mark Medoff, who helped form CMI in 2005, is the writer and producer. Joe Bullock, an NMSU alumnus and Las Crucean, wrote the novel, while John Hummer and Brad Beasley, both Las Cruces residents, put together the financing. “So everything about Herb from the genesis of the novel to the screenplay and the financing is all a Las Cruces effort,” Marks says. In addition to his filmmaking efforts, Marks has added to the CMI curriculum by training students how to run a film festival from start to finish. The Las Cruces International Film Festival, which has welcomed well-known film stars, such as Brendan Fraser and Cybill Shepherd, will celebrate its fourth year in 2019. The 2018 festival was put on entirely by students with the exception of three people. The LCIFF has doubled its crowds from year to year with about a third of the attendees coming from out of state. Marks expects as many as 10,000 people to attend the festival next spring, bringing what he estimates as $2 million to the Las Cruces economy. Lanasa emphasizes that although CMI has many accolades when it comes to film, the program also has a top-notch animation program, among the top 50 in the nation. 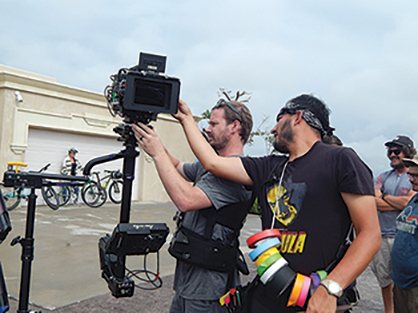 Thirteen years later, NMSU’s CMI is graduating filmmakers and encouraging entrepreneurs, who become employers, to open their own production companies. 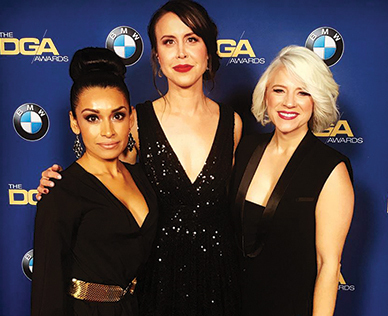 Beatriz Loera ’16 (left) is joined by film crew colleagues of “Godless,” a Netflix original series, at the Directors Guild of America awards in February 2018. Beatriz Loera graduated from NMSU’s CMI in May 2016 and has worked on multiple feature films and television shows as a production assistant. Loera has worked on major motion pictures such as “Creed 2,” “Captain Fantastic” and “Independence Day: Resurgence” as well as television programs, such as “The Last Tycoon.” When she’s not working, she comes home to Las Cruces. Loera says the best opportunity she had in CMI was to work on a feature film, “The Heart Outright,” while she was a student. Her advice for current and future CMI students? “Say yes to every opportunity and work with absolutely everyone. When you’re on the set of a full-blown production, you spend 12-18 hours a day working very closely with every department,” Loera says. A short film, “Good Night,” written and directed by New Mexico State University philosophy student Brandon T. Gass and starring NMSU students was accepted into the 2018 Festival de Cannes Short Film Corner/Cannes Court Métrage. Jessica Jimenez, an NMSU senior who is the lead actress in the film, accompanied Gass and two other NMSU students, Taylor Rodriguez and Nick Check, to the film festival in May 2018. The film festival not only provides recognition for their work but also the promise of professional contacts for their future careers. 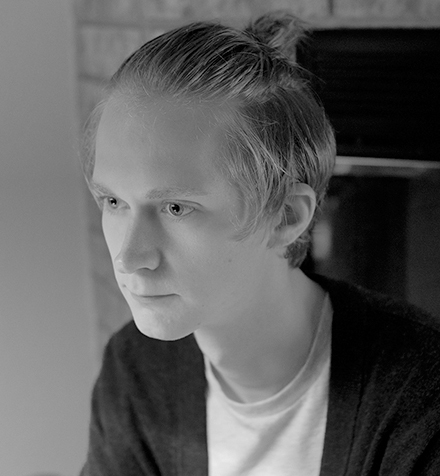 Gass, who will graduate in May 2019, not only wrote and directed the film, but also served as producer, cinematographer and editor. He has made six short films, two documentaries and 10 music videos. Cast and crew of Emcee N.I.C.E.’s music video “I Got Angels” filmed at Chapin High School in El Paso, Texas. A team from NMSU’s CMI produced the video, which was released in April 2018. 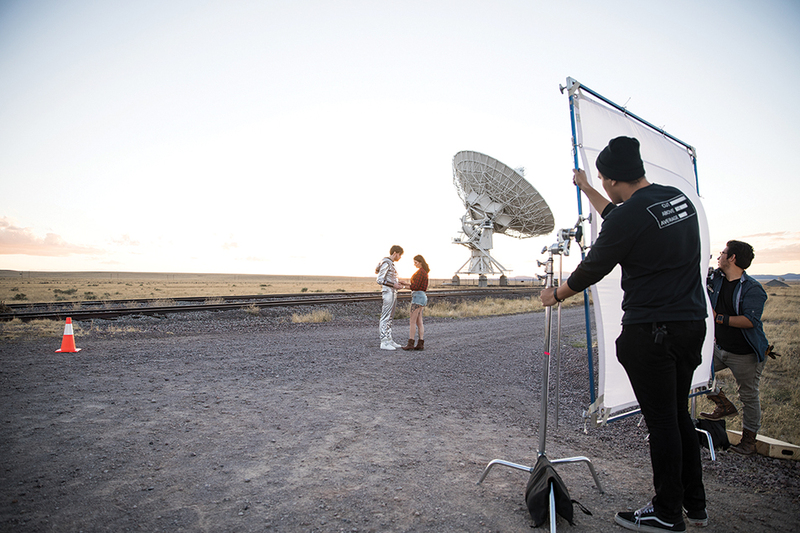 RUSE OF FOOLS’ music video was filmed across southern New Mexico, including White Sands National Monument, the Very Large Array near Socorro and Las Cruces with the help of NMSU’s CMI students and LNG Creative. 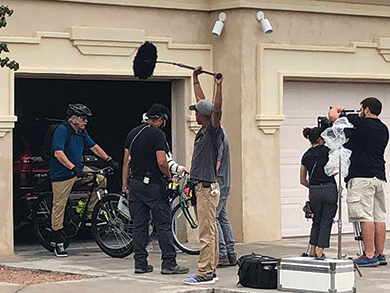 Students and alumni help film a critical scene in "Walking with Herb," filmed partly in Las Cruces.